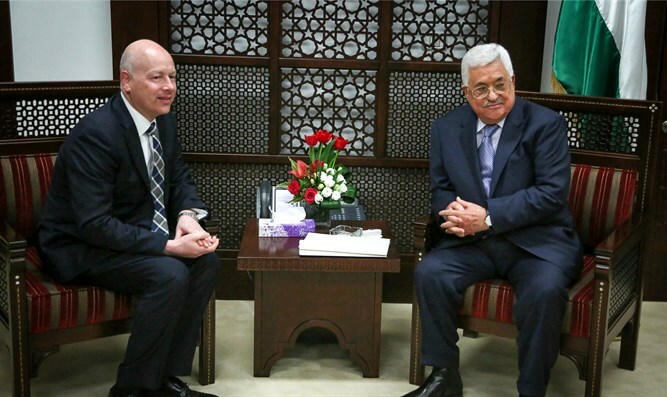 IMRA: Jason Greenblatt appears to have decided to facilitate Abbas “talking the talk”. “President Abbas and Mr. Greenblatt also reaffirmed the U.S. and the Palestinian Authority’s joint determination to combat violence and terrorism.” BUT Abbas CONTINUES to insist that any Palestinian detained by Israel for engaging in violence against Israelis be released! JERUSALEM – Palestinian Authority President Mahmoud Abbas met today in Ramallah with Jason Greenblatt, U.S. President Donald J. Trump’s Special Representative for International Negotiations. They reaffirmed the commitment of both the Palestinian Authority and the United States to advance a genuine and lasting peace between Israel and the Palestinians. President Abbas told Mr. Greenblatt that he believes that under President Trump’s leadership a historic peace deal is possible, and that it will enhance security throughout the region. President Abbas said he looked forward to discussing the possibilities for peace directly with President Trump during his upcoming visit to Washington. Mr. Greenblatt underscored President Trump’s commitment to working with Israelis and Palestinians to achieve a lasting peace through direct negotiations. Mr. Greenblatt emphasized the importance of all parties working to de-escalate tensions. President Abbas committed to preventing inflammatory rhetoric and incitement. President Abbas and Mr. Greenblatt also reaffirmed the U.S. and the Palestinian Authority’s joint determination to combat violence and terrorism. President Abbas assured Mr. Greenblatt that he is fully committed to creating an atmosphere that is conducive to making peace and would heighten his outreach efforts to the Israeli public. Finally, President Abbas and Mr. Greenblatt discussed plans to grow the Palestinian economy and the importance of ensuring economic opportunities for Palestinians, which would enhance the prospects for a just, comprehensive and lasting peace. ? President Abbas stressed to Mr. Greenblatt that the Palestinian strategic choice is to achieve a two state solution.